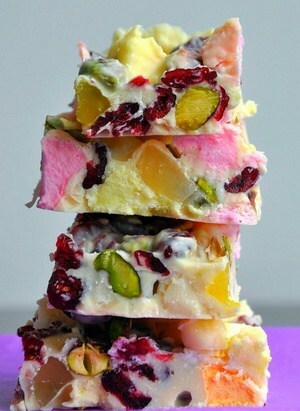 Try this tasty, colorful & delish White Chocolate Pistachio Fudge recipe! I love the Dandies Marshmallows because they are vegan and corn-free, but you can’t always find the colored ones, which are also flavored. (Beware of peppermint. No. Just no.) I really like Smashmallows too, they are dairy, gluten, corn & soy free, and the Strawberries & Cream and Coconut Pineapple flavors are pretty and delicious in this recipe. Smashmallows are larger marshmallows, so you’ll have to cut them into quarters. If you are using white marshmallows, you can tint the white chocolate slightly with natural food coloring, and that’s pretty too. This kind of natural food coloring is my favorite, or you can make your own. I’ve made this rocky road without jelly candies and added more dried fruit: I found chopped dried apricots and pineapple adds great color + flavor. Raw pistachios work well, and roasted pistachios will be lovely too, just slightly less green. But don’t use salted pistachios or any other salted nuts – added salt is not your friend. Bulk bins are a good place to find shelled raw pistachios. You can use dairy-free White Chocolate, but follow the manufacturer’s directions for melting rather than mine. When you make this recipe, snap a photo and tag me on Instagram @gfreefoodie! This White Chocolate Rocky Road recipe makes a deliciously gorgeous treat! It's so easy and such a hit, you may want to make a double batch. Line the base and sides of an 8 x 8 or 9 x 9 baking pan with wax paper and set aside. Roughly chop macadamias, marshmallows and candy and place in a glass or stainless steel bowl. Add the pistachios and cranberries and mix gently. Reserve a bit of the mixture for the top if desired. Break the chocolate into small pieces (unless using chips) and place in a microwave safe bowl. Microwave for approximately 45 – 50 seconds, then stir. Microwave for another 30 seconds then stir again. Repeat the process if necessary, until all the white chocolate is evenly melted and has reached a relatively thin consistency. Be careful not to burn the chocolate - a few unmelted lumps are better than burned candy. Pour the melted chocolate over the fruit, nut and candy mixture and mix well to ensure all pieces are thoroughly covered in chocolate. Pour into the prepared pan and then level with a spatula. If you saved some of the mixture to sprinkle over the top, do so now. Cover loosely and refrigerate for at least two hours or until set, then remove from the fridge, place on a cutting board (the paper will be very easy to peel off) and cut into your desired shapes and sizes. This will keep very well for at least a week in a sealed container at room temperature, though it may soften slightly at warmer "room temperatures" - and it probably won't last a week without being eaten! This White Chocolate Rocky Road Is A Reader Requested Recipe Conversion. Original image and recipe was provide by a G-Free Foodie reader, with a request for a gluten-free, corn-free version. I was deliciously happy to help! 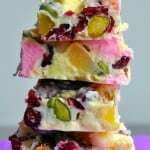 *If you require a longer shelf life for your White Chocolate Rocky Road or want to make this nut free, replace the nuts with different types of dried fruit or candy. This entry was posted in Desserts, Featured, Kid Zone, Recipes and tagged dessert, G-Free Foodie, gluten free cooking, gluten free food, gluten free holiday, gluten free holidays, kc cornwell, rocky road, white chocolate rocky road. Bookmark the permalink. ← Eat Gluten-Free at Oracle Park!